Adelaide Oval and its range of outstanding facilities will help you deliver corporate entertainment at its absolute best. 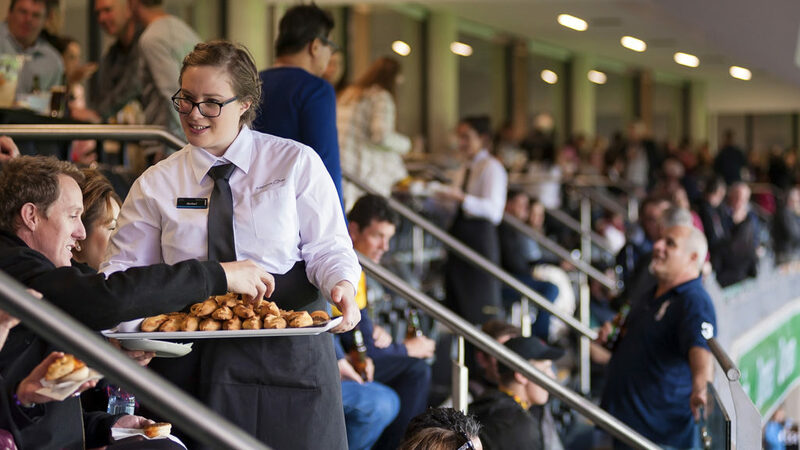 Whether you’re looking to entertain clients, impress potential clients, reward staff or network in style, Adelaide Oval is your destination of choice. The Audi Stadium Club is the first of its kind in South Australia, providing exclusive and fully transferable access all year round. Located on the third level of the Eastern Stand, the Audi Stadium Club provides padded reserved seating in a central position with access to cricket and football as well as preferential booking options for other Adelaide Oval concerts and events. Corporate suite holders have access to an incredible range of premier entertainment experiences, including sport, major events and live concerts. All of this is enhanced by the finest in food and beverage in the most modern facilities in Australia – taking corporate entertainment to a whole new level. What’s more, the ability to personalise each suite, and an advertising package valued at $30,000, provides a powerful branding opportunity for any business. The views are magnificent and the seats are the best in the house. The corporate and social environment is like no other Adelaide has to offer. With first class facilities being made available at each and every event the comfort and experience at Adelaide Oval can be enjoyed to the full. Staff have always been professional and polite in keeping with a facility of this standard. How did you hear about our Corporate Memberships? Is there a dress code in the corporate areas? Smart casual attire must be worn by all persons seeking or gaining admission to the Audi Stadium Club or Corporate Suites. Males wearing shirts without collars will not gain entry – even if worn under a sweater or jacket. Football jumpers are permitted however a shirt must be worn underneath. Children aged 10 and over must adhere to the adult dress standards. Adelaide Oval reserves the right to refuse admission to any person, who in the opinion of an employee or agent of the Adelaide Oval, is deemed to be inappropriately attired. Interested in Adelaide Oval Corporate Memberships?